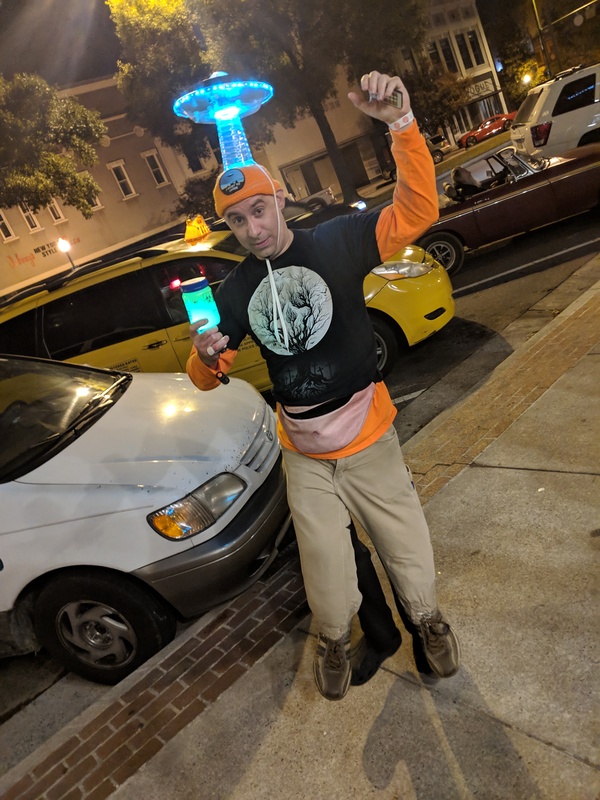 For my Lilliputian Alien Abduction costume I wrote a class called ReAnimator that generated all the UFO’s LED animations. To make it easier for someone to demo all the animations I wrote a program that runs all of the patterns and shows how to use the ReAnimator class. Here’s a video showing all of the patterns combined with different overlays. I reworked the code and the article for Project Ouroboros. You can see the update by clicking here. When I originally wrote the article in 2011 a USBasp programmer was around $6 on eBay, but now you can buy one in 2019 for about $1.50; pretty amazing. Here’s some code I wrote for the USBasp programmer board I played around with in Project Ouroboros. A bit surprisingly I had no trouble powering a WS2812B strip with just 3.3V. 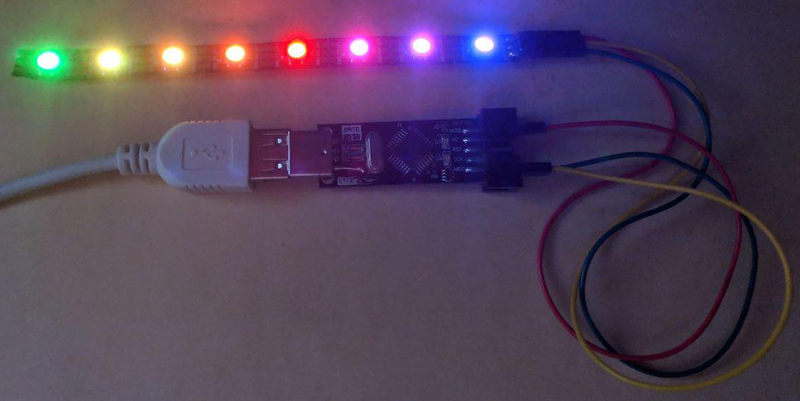 If you run this code on a 5V board you should change LED_STRIP_VOLTAGE to 5, although it’s not strictly necessary because that number doesn’t actually control the voltage. If you do change it to 5 then the power allotted to the LEDs will increase and they will get brighter. I tested the board with 100mW for the LEDs and I had no problems. //breathing();  // breathing isn't meant to be run by itself. combine it with one of the functions above. If using a FastLED function (e.g. FastLED.setMaxPowerInVoltsAndMilliamps()) to manage how much power your LEDs use FastLED limits the maximum brightness that can be set to a value that does not exceed the requested power draw. So if FastLED determines your power limited maximum brightness is M then calling setBrightness() with a value greater than M will result in FastLED setting the brightness to exactly M.
A breathing effect ramps the brightness up until it reaches the maximum brightness then ramps the brightness back down to a minimum brightness then starts the whole cycle over again. A naive approach would be to use a triangle wave that goes from 0 to 255 and back down to 0 as the input for setBrightness(), but if the power limited maximum brightness M is less than 255 then the brightness will plateau at M, and the brightness will remain fixed until the triangle wave input falls below M again. My breathing() function achieves a continually changing brightness by setting the peak of the triangle wave to M. However, M changes based on the number of LEDs currently lit and their colors, so breathing() recalculates M before setting a new brightness value. You may have read that you need to apply gamma correction or convert luminance to brightness so that the LEDs have a linear response. That is what I tried first, I never had success with that approach because of the clamping effect FastLED’s power management. After I figured out I had to determine the maximum brightness possible under power management conditions I found that the output of the LEDs looked linear to me using just a triangle wave, so I didn’t try to apply a correction curve. A point that confuses me is whether setBrightness() is actually controlling the brightness or the luminance. I couldn’t find a correction curve being applied when looking through the FastLED code. The function calculate_max_brightness_for_power_mW returns the same value as calculate_max_brightness_for_power_vmA so I’m mentioning it in this write-up to help people find info on it too. LED Brightness to your eye, Gamma correction – No! I created a pulse oximeter sensor using an ATmega32U2, a TSL230R, one red and one IR LED, and a clothes pin. The ATmega32U2 is used to read the frequency data from the TSL230R, control the LEDs, and send a stream of data to the host machine over USB. I wrote the code for the microcontroller in C and utilized the LUFA framework. I wrote a python program called pulseox_graph.py to receive the data from the microcontroller and display the photoplethysmogram, heart beat, oxygen saturation data. My AGPtek M20 and RUIZU X02 mp3 players have an odd way of ordering the mp3 files saved on the device. While you can save mp3s sorted into different directories onto the player it will still sort the files alphabetically as if they were all in one directory. From comments I’ve read using fatsort (or a similar program) on the device will make the files appear in the correct order, but it didn’t solve the problem for me; neither for the internal storage nor an sd card. This bash script will prefix all of your files with a unique number so that mp3s that share a directory will be listed/play next to each other by the player. # it plays them in the correct order. # the files after they've been copied to the player. # for files to play in the right order. # ZERO_PADDING should be 3, 1000s of files it should be 4, etc. # get the correctly zero padded prefixes. 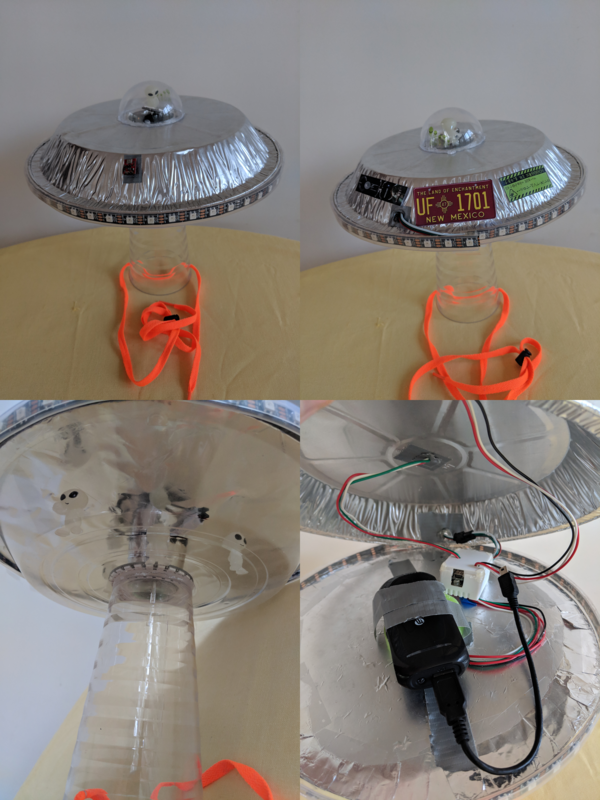 I made a UFO out of a pie tin and lit it up with a strip of 52 WS2812 LEDs. A ring of 24 LEDs was used to create a tractor beam effect, and a disc 7 LEDs was used to create a control panel. I scavenged parts from a busted LED controller that took commands by an IR remote control. 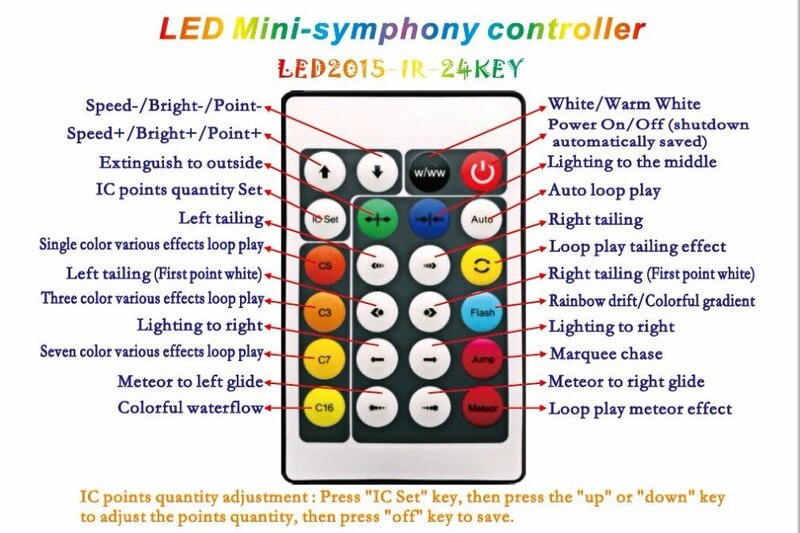 I reused its case, IR receiver, and remote control to create an new LED controller using an Arduino Nano that I wrote custom code for. To create a base for the controller and battery pack to sit on I made a disk out of poster board with aluminum foil glued to it. The dome at the top was half a two piece Christmas ornament globe. The LEDs running around the rim were simply attached with clear tape, since I had trouble getting glue to stick to the silicone sheath over the LEDs. The tractor beam is a ring of LEDs and a plastic drinking glass glued to the pie tin lid. I drilled two holes in the glass, and ran a shoelace through them so I could wear the UFO on my head. Since FastLED disables interrupts its not the best idea to use an IR remote with FastLED. However, I was able to make them work together reliably by not using delay() and creating animation functions that returned control to main() quickly. The code can create 22 different animations (referred to as patterns in the code) on the strip of LEDs that run around the rim of the UFO. Some of the patterns can be run in both directions and have variable speed. The pattern names are orbit, theater chase, running lights, shooting star, cylon, solid, juggle, mitosis, bubbles, sparkle, matrix, weave, starship race, pac man, bouncing balls, halloween colors fade, halloween colors orbit, sound ribbons, sound ripple, sound orbit, sound blocks, and dynamic rainbow. There are also effects (called overlays in the code) that can be added to a pattern to make it more dynamic. The overlays are breathing, flicker, glitter, and frozen decay. The color of a pattern can be set as a static color, a color that evolves, or a random color on every draw. To create the wall I used a 22″x28″ poster board that I cut down to 22″x23″. I created a graphic of the wallpaper and alphabet, and broke it up in to six ledger size (11″x17″) pages. I recommend using a glue stick to attach the printouts to the poster board. I used glue from a squirt bottle, but that wet the paper too much and made it wrinkle, which is not so bad because it gave the wallpaper an aged look. 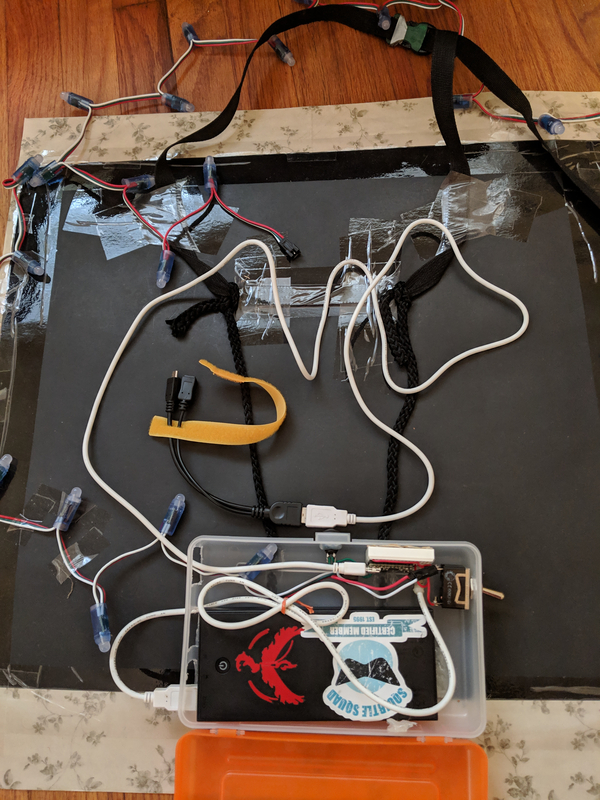 To attach the WS2811 LED Christmas lights to the alphabet wall I used hot glue. This doesn’t work the best though because the silicone cover around the LEDs can become unstuck from the hot glue. I believe wrapping some black ribbon around the silicone covers would make them stick to the hot glue much better. A nylon belt was attached to the board so I could hang it around my neck. The microcontroller board and battery pack are held in a pencil box attached to the back of the board. For the controller I used a Teensy 2.0 at 5V. I installed the Teensyduino add-on for Arduino so I could run Arduino sketches on the board. Using a Teensy specifically isn’t a requirement; it’s just what I had on hand. My sketch has several modes that can be cycled through by pressing a push button. One of the modes allows custom strings to be written by using a smart phone with a serial terminal installed and a USB OTG cable. 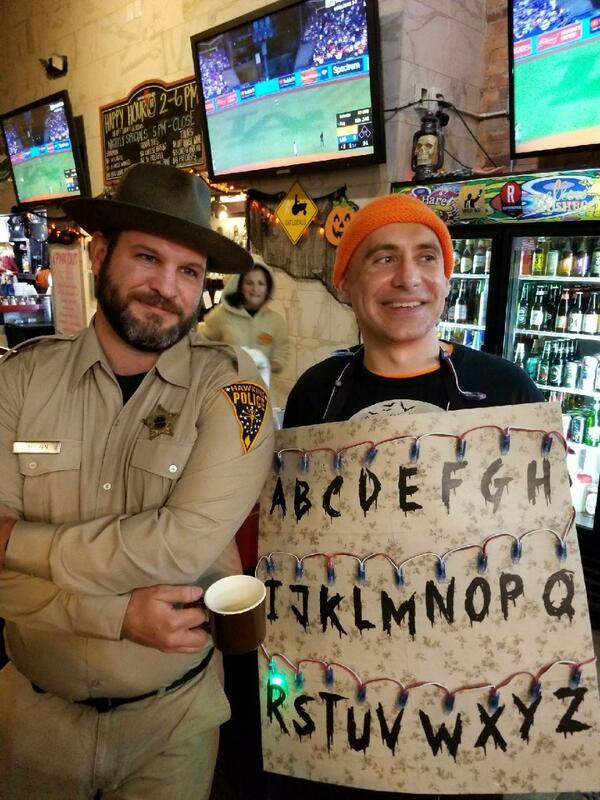 The video demonstrates the Stranger Things themed mode.